I’ve been left hanging about the fate of Quentin and Barnabas Collins after the fiery conclusion of The Rage Beneath. Unable to obtain the next episode in this particular audio series, or even to confirm what the next title is, I ended up purchasing a couple of other Dark Shadows dramatic readings, based on how interesting their descriptions sounded. As Maggie Evans leaves the Windcliff Institute, she begins to build a new life for herself away from the Collins family. But when an enigmatic stranger arrives in town, searching for phantoms, Maggie finds herself plunged into a world of intrigue and danger. What is the Ghost Watcher’s secret, and what is the true cost of his gift to the people of Collinsport? Dramatic readings, unlike audio dramas, are voiced only by one or two actors rather than a full cast. 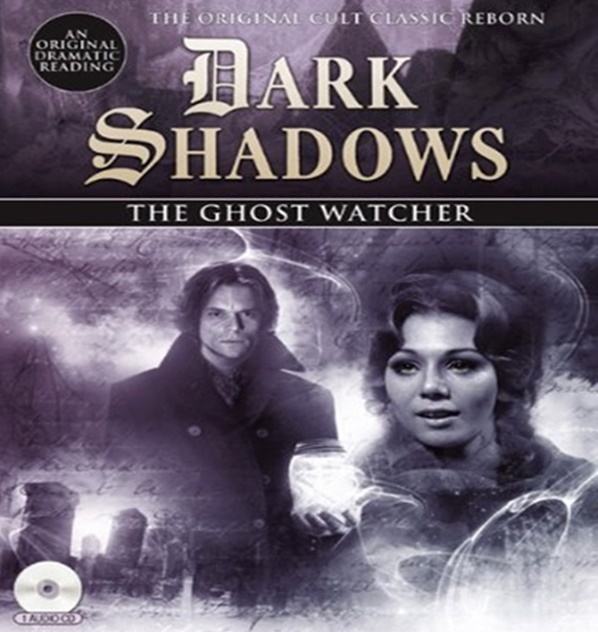 In this case, Kathryn Leigh Scott tells the tale through her character’s voice, assisted by Alec Newman as Nathan Hawkins, the Ghost Watcher. The Collins family are peripheral figures: Barnabas makes a brief appearance, Roger sort of floats around in the background, and Carolyn shows up a couple of times to converse with Maggie–but this isn’t their story. This one is Maggie’s own. It begins at an unspecified point in the early ’70s, after Maggie’s return to Collinsport. When last seen on Dark Shadows, she drove away with Sebastian Shaw to escape the influence of the vampire Roxanne. The couple checked in to Windcliff sanitarium. Some months later–we only know that it’s autumn–Maggie is deemed fit to come home, although Sebastian remains as a patient. Since, she tells us, Roger has finally sent his son David away to school, there’s no longer any need for a governess at Collinwood; the family has given her the deed to the Collinsport Inn as compensation for everything she suffered during her employment with them, as also as a bribe not to talk about it. Maggie is running the Inn when her remarkable guest arrives for an indefinite stay. He’s come to Collinsport, he says, “for the ghosts.” This adventure will be his greatest triumph. 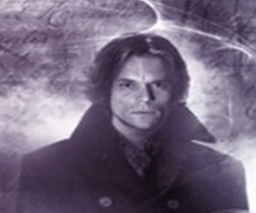 Although he bills himself as the Ghost Watcher, Mr. Hawkins also claims to have a wide range of supernatural experiences the world over–staking vampires and chasing down demons and a variety of fabulous beasties, as well as hunting ghosts. His personal charm and cute Scottish accent help to carry his tall-tales, but Maggie remains skeptical in spite of her attraction toward him. The other Collinsporters are wary to the point of hostility. One night, Nathan offers Maggie proof and takes her on a weird kind of date to Eagle Hill Cemetery, where he shows her the ghosts out and about. These spirits look something like Tinkerbell–tiny spots of light with streaming ribbons of gold and silver trailing after them. They seem to be the ghosts of children, but Nathan tells Maggie that they’re actually the dreams of the dead. They remember only the happy times, and will play forever. Endless games. But even at this wondrous moment, something ominous is lurking in the background. The little dream-spirits flee, and Nathan quickly takes Maggie away from the cemetery before this danger can make itself known. The next day, he provides proof for other people around Collinsport in the form of a gift left on every doorstep: a glass jar with a sparkling spirit-light sealed inside. These, each attached note states, contain “someone very close to you”. The person who receives each jar will know. “Look into the light and try to deny what you see,” Nathan’s note challenges them. Some people do look into the light, and what they see comforts them. As the elderly widow who runs the little general store tells Maggie, it’s not all of her late husband in there, but it’s the part of him that matters. It shows her that there’s something more beyond life. Maggie herself is horrified at the idea. She’s certain that the light Nathan gives her is supposed to be the spirit of her father Sam Evans, and she rejects it. It sounds as if the glass breaks during this scene, but nothing ever comes of it, so I’m not certain what happens to Sam’s ghost-in-a-jar. Maggie visits Eagle Hill Cemetery a second time alone and sees the ghost-lights at play again–although, this time, the idea of endless games doesn’t seem like so much fun. While she doesn’t make contact with the spirit of her own father, she does have a significant conversation with a very old ghost, the original widow whom Widows Hill is named after. This faintly visible spirit, who has passed into the realm of myth and legend, calls herself “the saddest of things”: a ghost who has forgotten her own name. The Ghost Watcher is a strangely sweet, touching story about connecting–or not connecting–with lost loved ones, until that ominous Something sensed up at Eagle Hill comes into the town. Whatever it is, it wants the contents of those jars back badly enough to attack people and break into their homes. It also wants Nathan Hawkins. It’s on the night of All Souls, November 2, as Maggie and Nathan flee from the Inn to try and hide from the creatures pursuing him that the truth about the Ghost Watcher emerges: behind the tales of supernatural adventures, and his diary with its impossible dates, lies something that isn’t madness, but much sadder. I maintain my opinion that this is a sweet rather than a spooky ghost story. It is ultimately a romance for Maggie.